Like I mentioned on my first post, orchids are my favorite flower. I think they are amazing on their own and they add a lot of dynamic and excitement to any arrangements. In this post I will be using dendrobiums orchids, they are small and delicate and have beautiful colors. They should also last up to three weeks or more if kept in a cooler room away from direct sunlight. My boyfriend is selling his house and I've been helping him get it ready. Of course this meant an opportunity for me to create sassy arrangements to put around the house. At Bunches you can get usually get a bouquet of assorted dendrobiums orchids and greenery for $14.99, or you can get just a stem for $4.99. In the bouquet you get five stems of orchids, one beautiful big leaf (sorry I don't know what kind it is) and some grass. I think it's a great deal because you can make a few arrangements with it. I divided the bouquet into three different arrangements. I did buy an extra stem of orchids as well so I could have two stems in each arrangement. I made three different arrangements for a total of about $30, so that's about $10 dollars each. I think that's not too bad especially if you have a big house and want to add flowers to different rooms. I divided the orchids into three groups: white and soft pink, white with pink, and green and purple. I also divided the grass so they all got a few strands, and I included the big beautiful zebra looking leave with the green and purple since the colors looked so good together. The white and soft pink create a relaxing mood so I placed those together in a small simple vase and put in the in washroom. This creates a relaxing and spa inspired room. The white with pink center orchids I put in a tall hour glass because they have a beautiful and sophisticated look to them. I places the at about 45 % each so that they would play off the hourglass look. I placed them in a darker room on a table against the wall with books and a big Buddha painting. I think they gave the room a softer more feminine look and it enhanced the beauty of the painting. I had to put the colorful green and purple orchids in a big round vase at first because I didn't have all my vases with me. A few days later I went shopping near the house and bought a thin tall vase which I think worked a little bit better for the arrangements. I put the green and purple together since the green orchids come highlighted with a beautiful purple already that matched the full purple orchids. I think these two colors look so great together. I also added the big zebra leaf because the color went perfectly together. A colorful arrangement like this can look great in a kitchen, dinning table or any room you want to add color to. I just love the green and purple. I had so much fun creating all three sassy arrangements and dressing up the house with them. It gave the house that extra edge for showings. The orchids were also great because when kept in cooler rooms away from direct sunlight will last a long time, up to three weeks or more. Two of these arrangements are still beautifully being displayed at Brian's house. Unfortunately it was too hot in one of the rooms so one of them didn't make it but I was still able to use the flowers that made it into different arrangements so they weren't wasted. Adding a bath tray with a pretty small flower arrangement can add that spa relaxing look to any bathroom. I love the white with pink highlight, it adds a soft and feminine look to any room. 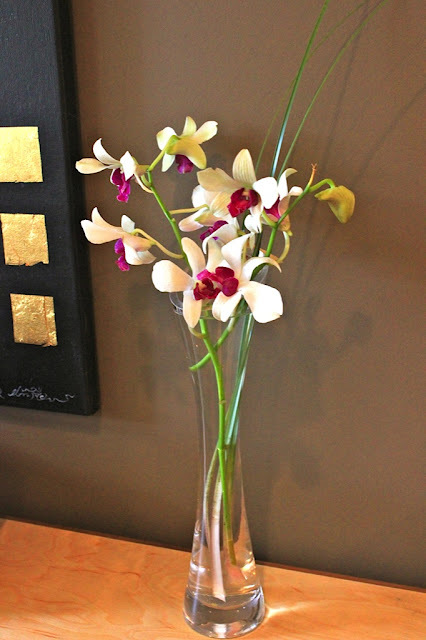 I really like that triangle look you can create with orchids by angling them when placing them in a wide rim vase. This beautiful green and purple orchids add an exotic bight look to any room. The orchids shown in the bigger vase. The orchids shown in the thinner vase. I think this displays them a little bit better, but both look pretty enough. Looked great placed around earthy colors, an linear lines. Unfortunately our bedroom was too hot during the really hot week we had in July and the purple orchids started to look kind of droopy so I took them out of the vase. I took all the flowers off the stem and placed them in my little boat vase with some green mums I from a previous arrangement that were still alive. I love taking the flowers that are still alive from old arrangements and creating something new and sassy with them.